When it comes to salted caramel, this recipe is as versatile as can be. 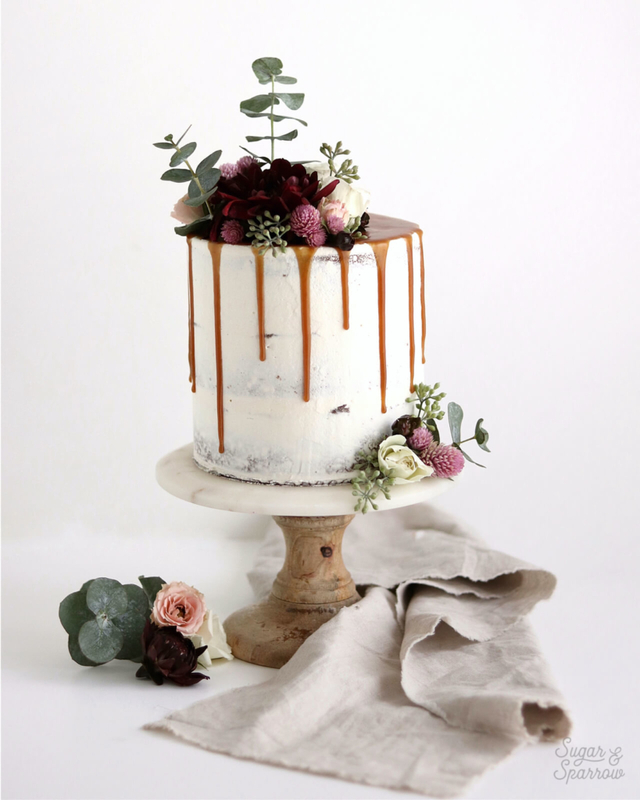 I’ve used it to drip cakes, drizzle cupcakes, coat apples, top ice cream, and have even whipped it up into salted caramel buttercream! It’s one of my forever go-to’s that has never let me down. 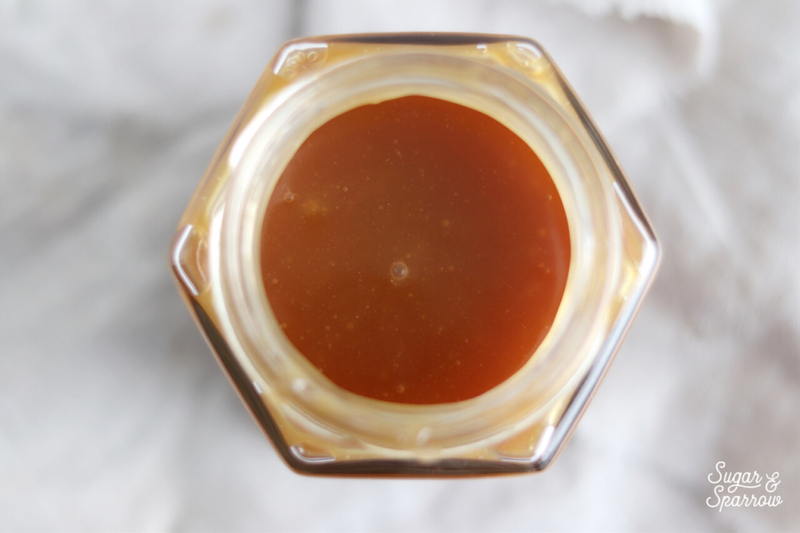 If you’ve ever struggled with salted caramel before, I hope this one becomes your fail-proof friend. While I’ve tried my hand at some more intricate salted caramel recipes before, this one is my favorite for a few reasons: there are only four ingredients involved, it turns out the same every single time, and it’s the perfect amount of sweet and salty. I have been known to eat it by the spoonful! One of the keys to success with this recipe is to have your ingredients already pre-measured, room temperature, and ready to go, because you’ll constantly be stirring and whisking. We all know that caramel likes to burn when you stop stirring even for a few seconds (it’s sneaky like that! ), so it’s always good to keep those pre-measured ingredients and recipe instructions close by. That’ll keep you cool, calm, and collected throughout the entire process. Another good tip is to have an oven mit or glove handy so you don’t burn your hand while whisking. When certain ingredients are added (butter and heavy whipping cream specifically), the salted caramel will bubble rapidly and send all the steam toward your whisking hand. Trust me on this one. From start to finish, this salted caramel recipe only takes about fifteen minutes. After you make it, you can leave it out on the counter to cool before using it in a recipe (like this tasty salted caramel buttercream) or put it in an airtight container to store in the fridge for up to two weeks. It reheats just fine in the microwave if you’re a make-ahead type of baker and makes a great gift if you’re looking for some yummy DIY’s for the holidays. Whether you gift it, whip it up into buttercream, drizzle your desserts, or dip your apples in it, this salted caramel is sure to please and easy as can be! Just the way I like it. 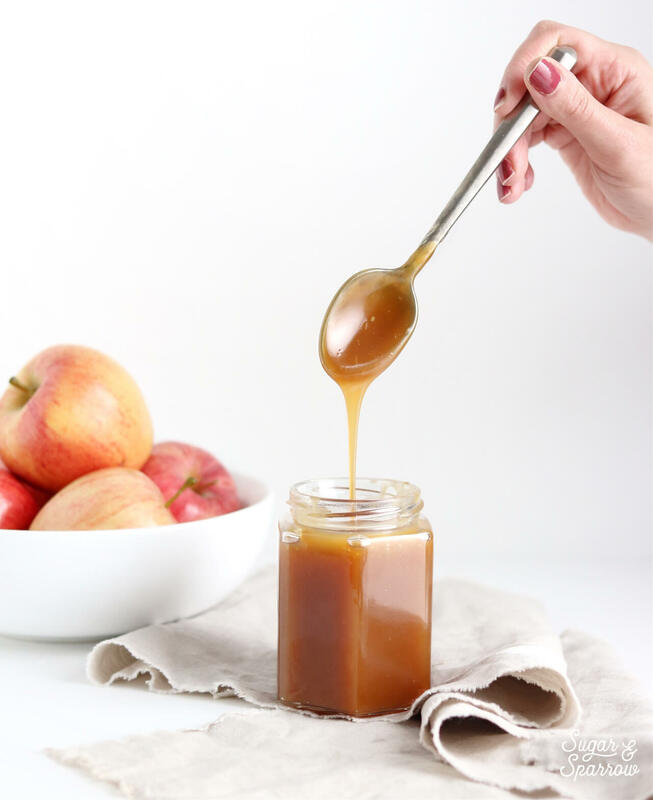 An easy and versatile salted caramel recipe that's perfect for dripping cakes, drizzling over desserts, dipping apples, or eating by the spoonful. Have everything pre-measured and ready to go (you’ll be constantly stirring). 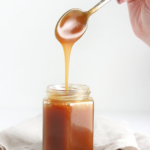 Place the sugar in a medium saucepan over medium-high heat and stir constantly with a wooden spoon, until it melts into an amber-colored liquid and no sugar clumps remain, 5-6 minutes. Reduce the heat to medium. Carefully add the butter (it will bubble up when you do) and use a whisk to combine it with the sugar mixture until the butter is fully melted and incorporated, 2-3 minutes. Add the heavy whipping cream in a steady stream while whisking. 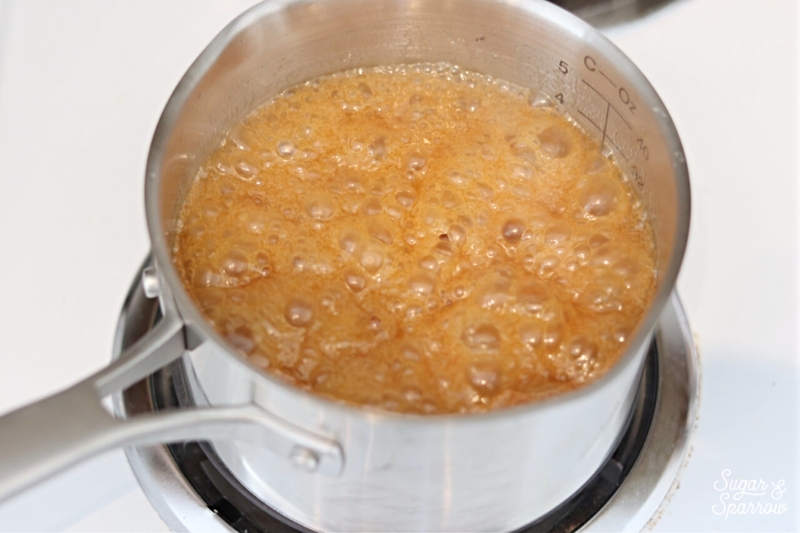 As soon as the cream is incorporated, let the caramel boil for a full minute before removing it from the heat and stirring in the salt. Let the caramel cool to room temperature* before using it in a buttercream recipe or as a cake topping. If you're using it to drizzle over ice cream or warm baked goods, you only need to cool it slightly (20 minutes or so). It will thicken as it cools. Make Ahead Tip: You can make this salted caramel ahead and store in an airtight container in the refrigerator for up to two weeks. When you're ready to use it, reheat it in the microwave in 15 second intervals until it reaches room temperature. *The term "room temperature" will vary depending on your environment. 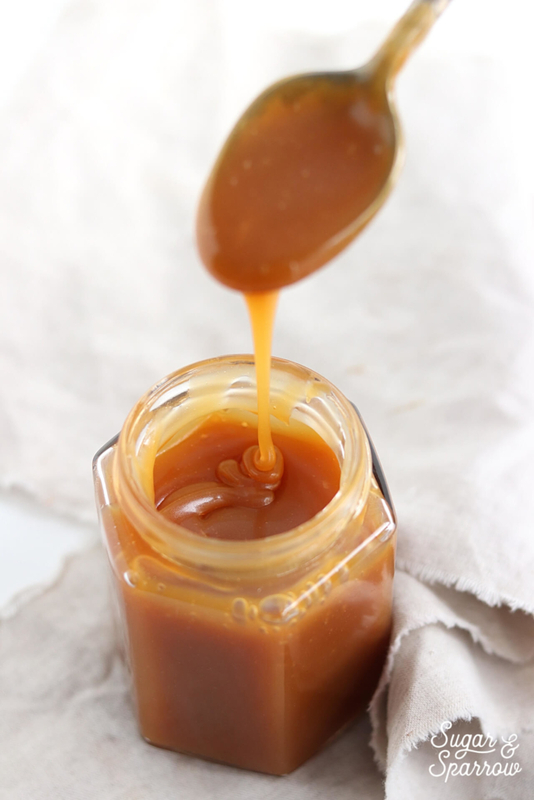 This caramel should be soft and set at about 70ºF. If it's too firm at room temperature, simply microwave it in 10 second increments until it's runny enough for dripping/pouring but not hot enough to melt buttercream. I use the same recipe! Has never failed me. It’s delicious! For caramel apples do we dip right away? Hi Shamonte! For caramel apples, let the salted caramel come to room temperature before dipping. Let the excess caramel drip off the apple and place each the dipped apples on a sheet of wax paper, then chill them in the fridge for about 15 minutes to set. Hi! I just made this sauce and it’s delicious. Mine has hardened into a hard candy. What consistency should it be, and what might I correct for next time? Hi Vicki! I’ve never had it harden before – it should be soft enough at room temperature to dip a caramel apple in. My guess is that either the sugar might have been cooked for too long, the stovetop was too hot, or the heavy whipping cream was omitted. You have to really watch it and make sure you move on to adding the butter as soon as all the sugar clumps have melted (stirring constantly), make sure that the heat is on medium-high and not fully high, and be sure to add all of the ingredients at the specified time. At what point did it harden? I experienced the same thing! When it was freshly made, it’s nice and runny. Once it’s turned into room temperature, it’s hard like candy. I tried microwaving it, the oil somehow separated from the sauce. Any idea why? Hi Rosa! If the butter is separating from the sauce after settling that means it wasn’t fully incorporated in the cooking process. 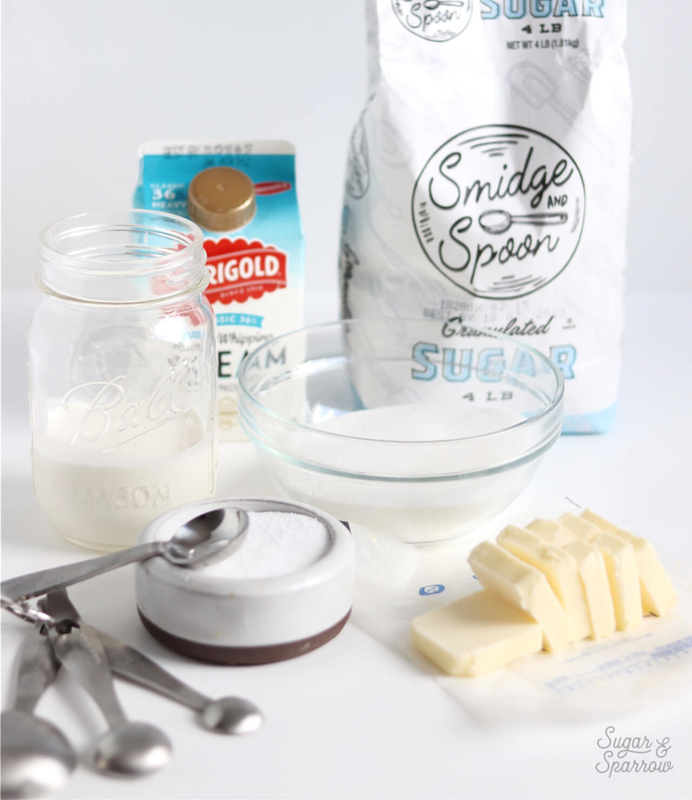 When you add the butter to the melted sugar, it will boil rapidly, but you have to whisk it rapidly until it is fully melted and combined with the sugar mixture. The good news is, even though your butter and sauce separated and your caramel is firm, it’s easy to bring back by microwaving it in 10 second increments until it’s runny again, then whisking it all together into a uniform mixture. Mine was great but now that it is in the refrigerator it’s hardened as well. I can’t scoop it out of the container easily. It’s like the texture of a caramel chew…. any advice? I followed the recipe to a T. The only thing that was different is you said melting the sugar would take about 6 mins but mine took about 12. I did add my sugar to a cold pot though so I think everything was just heating up. It was about 6 mins from when it started getting clumpy until it was fully melted. Any advice is much appreciated! I was going to bring carrot cake with caramel filling and cream cheese frosting to an wasyernparty tomorrow! Hi Torah-Yah, the caramel will be hard when it’s cold. To bring it back to gooey caramel consistency, you’ll need to microwave it in 15 second increments, stirring after each time, until you’ve reached your ideal consistency. Hi Whitney, can you use brown sugar in this recipe instead of white? Hi Pamela! I’ve never tried this recipe with brown sugar before, but I know that some caramel recipes call for brown sugar instead of white so it’s totally worth a try. If you decide to substitute brown sugar let me know how it goes! 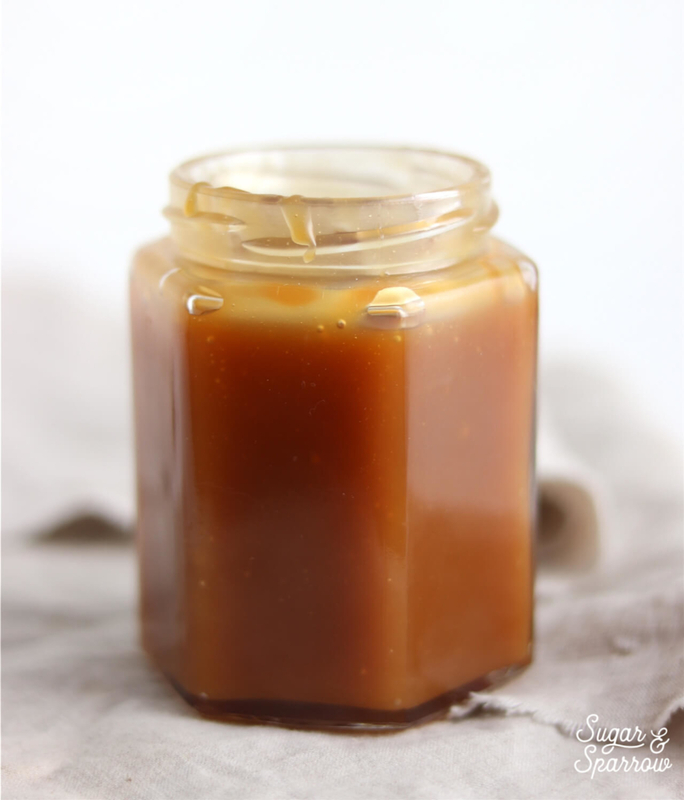 Just a wonderful caramel sauce, my go to forever more!! So happy to hear that, Wendylou!